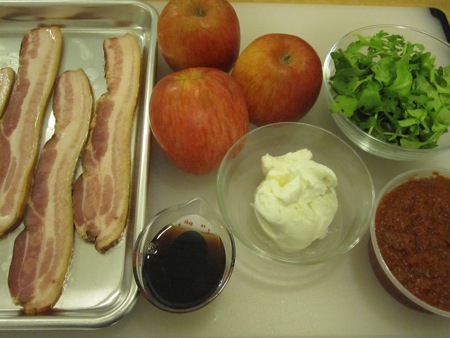 came to the rescue with this simple recipe for Fuji Apple Salad (with kimchi, smoked jowl, and maple labne). I assembled the ingredients, making adjustments to feed only three instead of four: three Fuji apples (scaled down from four), a half cup of pureed napa cabbage kimchi, a half cup of labne (thick middle eastern yogurt), a quarter cup of maple syrup (Vermont dark grade B), a cup of loosely packed arugula, and three quarters of a pound of thick-cut bacon (scaled down from a full pound). The recipe calls for sliced smoked country jowl, but allows bacon to be substituted. 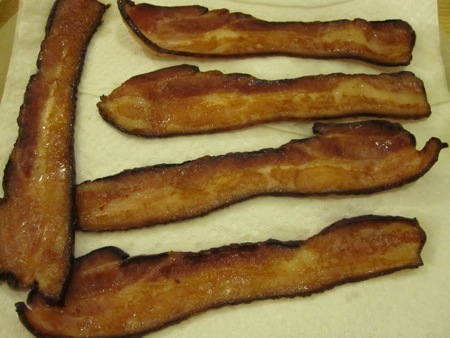 I put the sheet pan with the bacon into a 35o°F oven and let it cook until just crisped, about twenty five minutes. 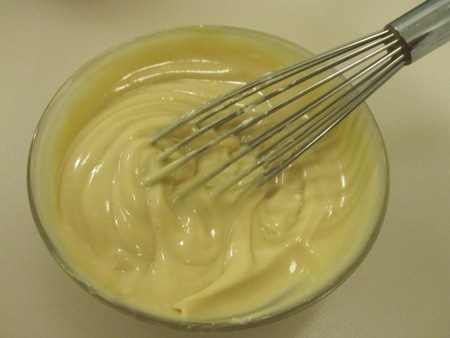 While it cooked, I whisked the labne and maple syrup together until the mixture was smooth. 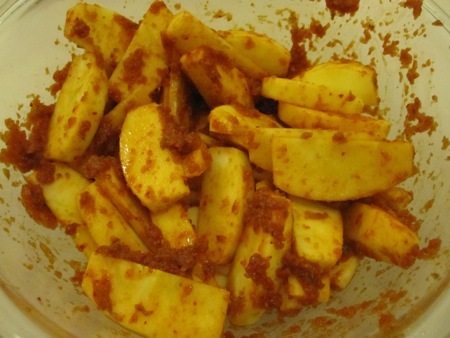 I peeled the apples, cut them into slices about a quarter of an inch thick, then tossed them in a bowl with the kimchi puree. By this time the bacon was ready, so I drained it on paper towels. I tossed the arugula in about two tablespoons of olive oil and some salt and pepper. To assemble the dish, I smeared about two tablespoons of the sweetened labne on a plate and topped it with a stack of the kimchi apples. I cut the bacon slices into thirds and leaned the pieces agains the pile of apples. 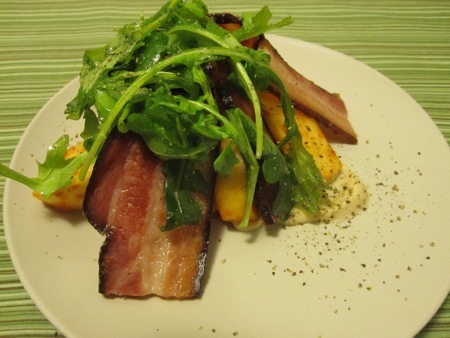 I placed a small handful of the arugula over the bacon, then dressed the plate with a few grinds of black pepper. For a dish with so few components, there was a lot going on. The kimchi apples were sweet and spicy and crunchy all at once, the peppery arugula added a bitter note, and the maple labne kept the kimchi heat from becoming overwhelming, as well as providing a classic complement to the bacon (bacon & maple: a classic combination). She Who Must Be Obeyed demanded that I keep the extra labne to use as a topping for sliced apples as a snack. I want to make this again, but I’ll have to start with a new batch of kimchi and a few more recipes in which to use it. I’m still acquiring a taste for fermented cabbage, so it may be a while before we see this dish again. Kimchi and apples seems like such a great combination. Isn’t it always nice to find a Momofuku recipe that can be assembled in less than a day? I will have to try this salad out.